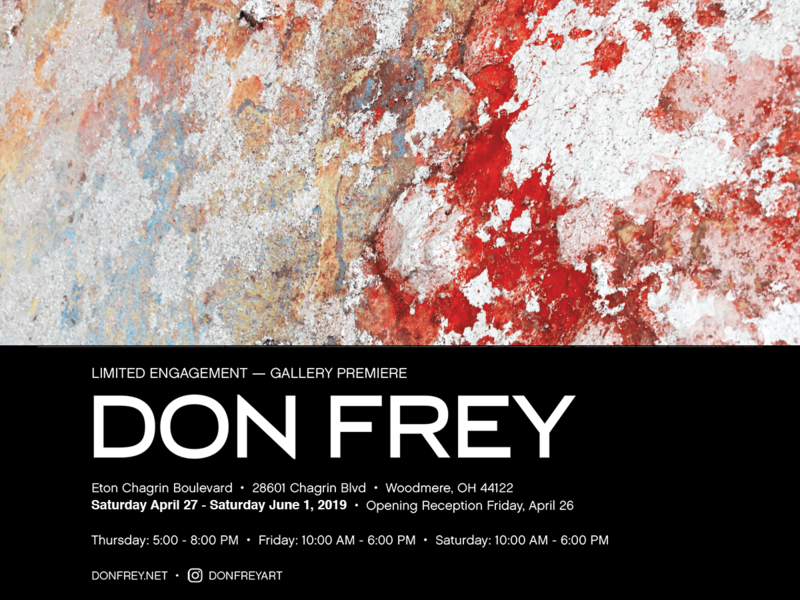 Cleveland resident, Don Frey, will premiere his art exhibition for a limited engagement at Eton Chagrin Blvd opening Saturday, April 27 through Saturday, June 1, 2019. The gallery will be located inside Eton’s atrium next to Matina’s Bridal and hours will be Thursdays 5:00 p.m. until 8:00 p.m. and Fridays & Saturdays 10:00am until 6:00pm. Having grown up in the Midwest as a child, Frey was captivated by nature and its vast colors and textures upon close examination. With that inspiration, his passion for art incorporates these stunning and varied pieces of nature. The gallery will exhibit these dazzling paintings that capture the essence of nature in its most basic and raw form. They are not just simple representations of nature, but rather an artistic collaboration with nature. Frey’s artistic process begins outdoors, year-round, as paint is applied to a stretched canvas and still-wet oils are manipulated into organic patterns and textures. The complexity emerges when crushed leaves, weeds, sand and other natural matter are layered within the wet oils. Especially striking are the pieces of art that are integrated with frozen snow. Frey, who is also a senior graphic designer for a global professional services firm in Cleveland, creates new emerging pieces of art inspired by everything surrounding his environment. The process of his artistic creation continues as colors, water and occasional fire are incorporated into the creative mix, further altering every painting’s finished appearance. The entire process for creating such a unique association with various forms of nature will often take months to complete. From ice to fire, and everything in between, each piece is completely unique.